HEADS UP A head-to-head comparison finds that heading a soccer ball may damage white matter in women's brains more than men's. 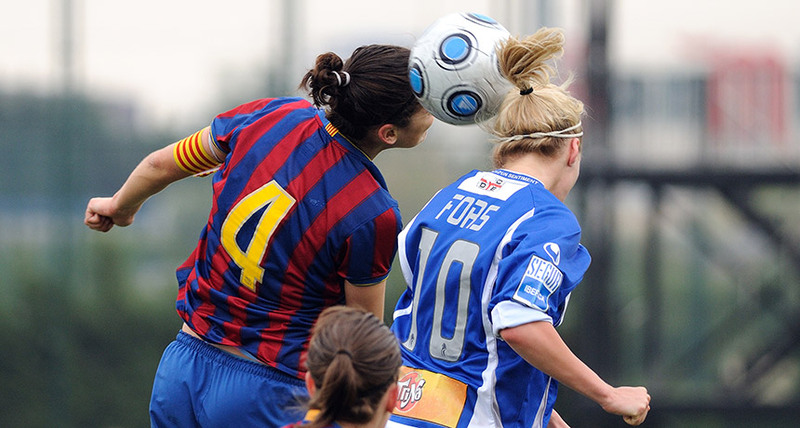 Heading soccer balls may have high stakes for women's brains, a study of amateur soccer players suggests. Among amateur players who headed a similar number of balls, women had more signs of microscopic damage in their brains' white matter than men, scientists report July 31 in Radiology. Female athletes are known to have worse symptoms after brain injuries than male athletes, but a clear head-to-head comparison of post-heading brains hadn't been done until now. From 2013 to 2016, study coauthor Michael Lipton of Albert Einstein College of Medicine in Bronx, N.Y., and colleagues recruited 98 soccer players from amateur teams, including from colleges. The researchers then compared male and female players who headed the ball a similar number of times over the past year. For men, that median estimate was 487 headers. Women had an estimated median of 469 headers. Despite those similar numbers of head knocks, women's brains had more spots that showed signs of microscopic damage. A type of magnetic resonance imaging scan called diffusion tensor imaging identified brain regions with changes in white matter, bundles of message-sending fibers. In some cases, those altered spots indicated possible damage to nerve cell axons and myelin, a protective coating that speeds neural signals along. In men, only three brain regions showed potential damage associated with heading frequency. In women, eight regions showed signs of damage with frequent heading.